Easter Sunday is this weekend so I thought it would be the perfect time to write a post about eggs….Happy Easter everyone! In the past people were often told to stay away from eggs, or at least the yolk, due to their high cholesterol content. It was thought that consuming high dietary cholesterol would affect the amount of cholesterol in our blood and raise our risks for heart disease (makes sense). However, research has since shown that consuming foods high in saturated and trans fats have more of an affect on our blood cholesterol levels than consuming actual cholesterol. While it is more accepted that it is ok for healthy people to consume eggs in moderation, some patients with high cholesterol levels or established heart disease are still told to stay away from eggs. In a recent study of 32 adults with coronary artery disease, participants were randomized to consume either breakfast with 2 eggs, 1/2 cup of egg beaters, or a high carbohydrate breakfast for 6 weeks. No significant differences were found in the cardiac risk factors measured (flow-mediated dilatation, lipids, blood pressure, weight) and the authors concluded that there were no adverse effects of daily egg consumption on cardiac risk factors in their participants during the 6 week trial. So eggs aren’t bad, But are there benefits to eating eggs? Yes! Eggs are a great source of protein, and multiple vitamins and minerals. It also contains lutein and zeaxanthin, carotenoids that can help to prevent macular degeneration (a cause of age related blindness). In a study with 33 adults >60 years old, consuming 1 egg per day was found to significantly increase serum levels of lutein, and zeaxanthin without increasing serum lipids or cholesterol concentrations. Eggs also contain omega 3 fatty acids, which is the good kind of fat that is also found in fish. 1. Am Heart J. 2015 Jan;169(1):162-9. doi: 10.1016/j.ahj.2014.10.001. Epub 2014 Oct 7. Effects of egg ingestion on endothelial function in adults with coronary artery disease: a randomized, controlled, crossover trial. Katz DL, Gnanaraj J, Treu JA, Ma Y, Kavak Y, Njike VY. I am a big fan of adding extra fruit or vegetables into recipes…they can contribute a lot of nutrients such as fiber, vitamins, minerals and are generally low in fat and calories. And also, I think they are delicious. But you still need to be careful with what you add to your fruits and veggies. Yes, french fries are made from potatoes but when you deep fry them you can no longer call them healthy. 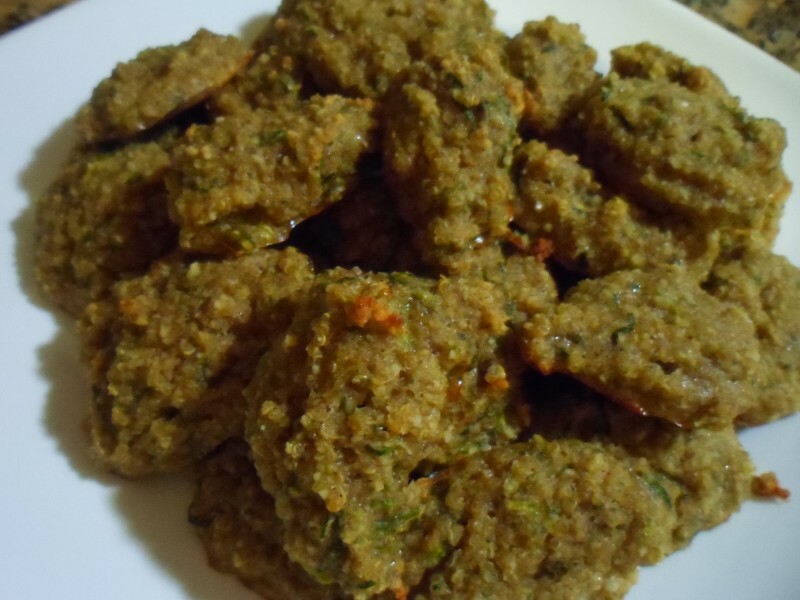 Zucchini bread is also great in theory, you can hide some veggies in a delicious mixture of sugar and all purpose flour, but the sugar and refined flour part really isn’t so good for you. But no worries, you can definitely make it healthier by replacing refined flour with whole grains or nut flour and using less sugar, and maybe using something like fruit to help sweeten it a healthier way. Preheat oven to 325 degrees. Bring 1 cup of water to boil in a medium saucepan. Add quinoa and cover and reduce to a simmer for about 15 min or until quinoa is cooked. Add almond flour, cinnamon, baking powder and salt to a large mixing bowl and stir. Add egg, mashed banana, zucchini, vanilla, honey and mash together with a spoon until uniform. Add quinoa after it is done cooking and is mostly cooled; stir in. Drop by spoonfuls down onto a parchment paper lined baking tray. Batter won’t be as thick as usual cookie dough and consistency will be more like thick muffin batter. Bake for about 30 minutes or until cookies become slightly brown on edges and cooked through. Sorry I haven’t posted for awhile but we recently had to move fairly quickly so the past couple weeks have been occupied by finding a new place to live, packing, and then unpacking and settling in. Moving can be so stressful! Now that we are actually settled in, I should be posting regularly again. I love plantains. I didn’t grow up eating them and I’m not sure if I had even ever tried one before I moved down here to south Florida, but I really enjoy eating them now. 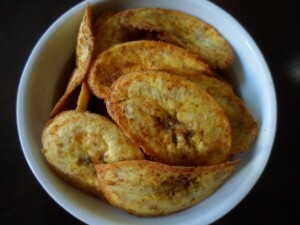 Because I don’t eat corn, or wheat (due to GI issues), I like to use plantain chips instead of tortilla chips as dippers for guacamole or salsa. However, store brand versions are not always the best choice, and are often deep fried, so I like to bake my own with heart healthy oil. I can also easily change up the flavors by adding my favorite spices. 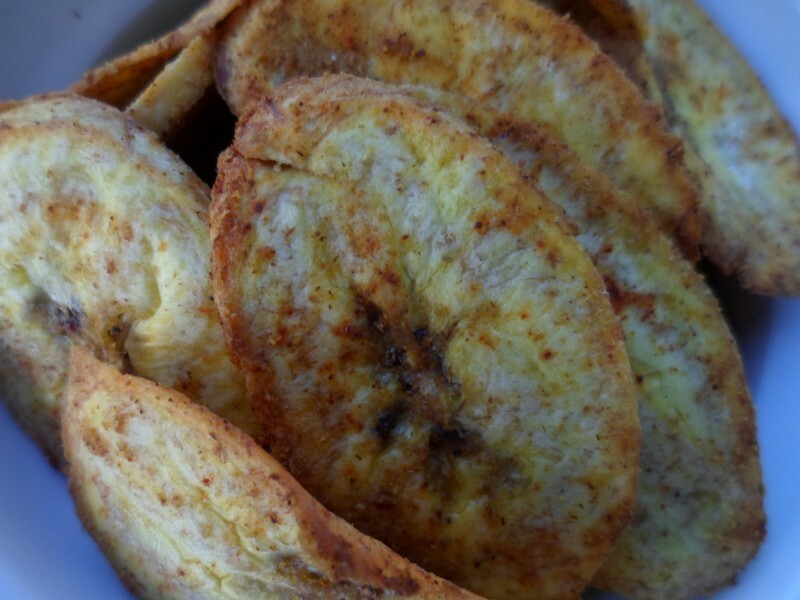 Plantains are rich in potassium, which is very important for your heart. Studies have shown that potassium can even help to reduce blood pressure in those with hypertension. 1/2 of a medium plantain contains almost 450 mg of potassium, which is equivalent to about 1 cup of orange juice. Preheat oven to 375. 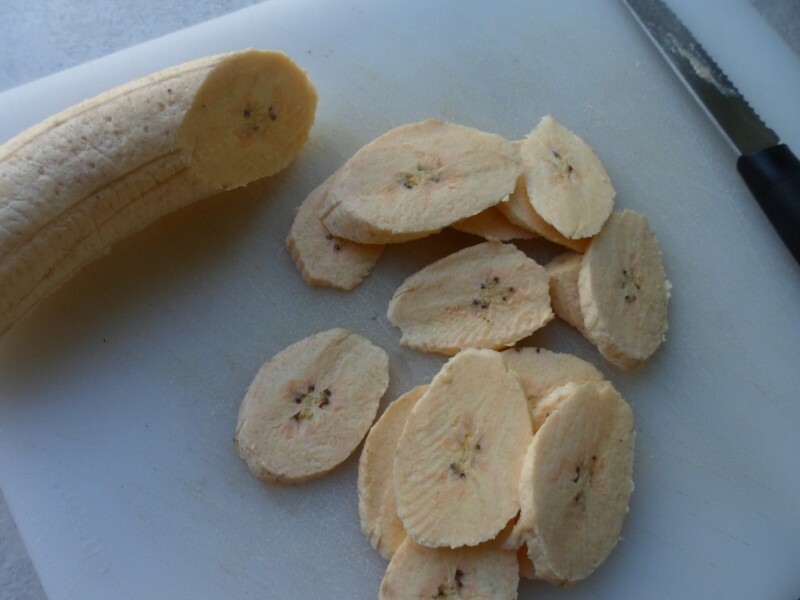 Cut off each end of the plantain and cut a seam down the middle through just the skin so you can easily peel the skin off. Cut thin oblong slices. Place slices in a bowl with olive oil. Toss to coat. Add cumin and paprika and toss until evenly distributed. Lay on parchment paper on a baking sheet. Bake for approximately 20 minutes, flipping halfway.